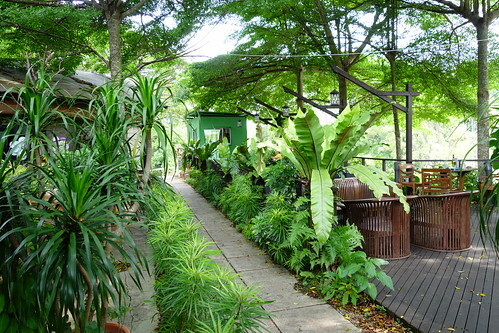 Nestled amidst lush greenery behind the old racecourse at Bukit Timah Road, Royal Thai is a hidden gem that serves authentic Thai food at its open air restaurant. Though there are many Thai restaurants in Singapore, not all of them serve authentic tasting Thai food. I was glad to have been introduced to Royal Thai by Wee Teck from The New Paper. To get there, you'd have to drive past Bukit Timah Saddle Club to the end of Fairways Drive, a secluded road off Eng Neo Avenue. There's a fairly large open air parking lot in front of the restaurant. Next to the restaurant is Champions Golf, previously known as Green Fairways. I used to learn how to play golf at Green Fairways so it was nice knowing that the driving range was still around even after a decade. 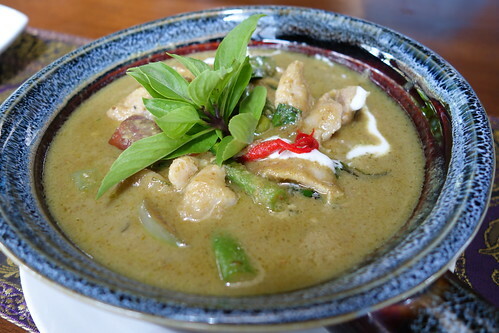 My favourite dish at Royal Thai is the Green Curry. I've been thinking about it since my first visit to Royal Thai last November. The succulent chunks of chicken and firm vegetables had been simmered in a fragrant and slightly spicy coconut sauce. Tasty and creamy without being heavy on the stomach, the green curry goes perfectly with steamed rice. Although Thai Green Curry is a popular dish that's found in most Thai restaurants, not many of them do it well. They were often a little too sweet for my taste and the chicken too dry. I loved the balance of flavours in this dish as well as the tender and juicy pieces of chicken. This is the best Thai Green Chicken Curry I've had since a Thai client took me to a local joint in Bangkok many years ago. The Thai Green Curry Chicken is definitely a MUST-TRY! When we visited for lunch today, we were recommended an off-menu special - Goong Ob Woon Sen (Claypot Prawn Tang Hoon). 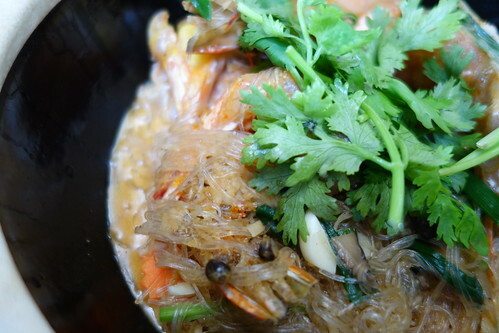 The springy strands of clear mung bean vermicelli (tang hoon) had been well-infused with the flavourful sauce. I loved the hints of cilantro root, black peppercorns and garlic in the sauce. The juicy and firm prawns added a touch of umami to the dish. This dish is also a Must-Try if it's available when you visit. 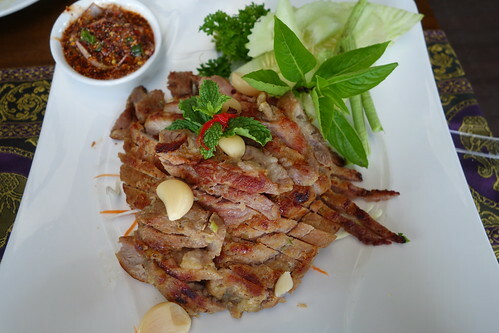 We were a little disappointed with the Grilled Pork dish because the meat was rather dry and bland. The accompanying sauce which tasted like a blend of Nam Prik Prao (Thai roasted chili sauce), tamarind juice and Thai palm sugar helped somewhat but couldn't save the slightly tough and dry pork. The portions here are fairly generous so pace yourself when ordering else you might face the same problem as J and I did today - no room for desserts. 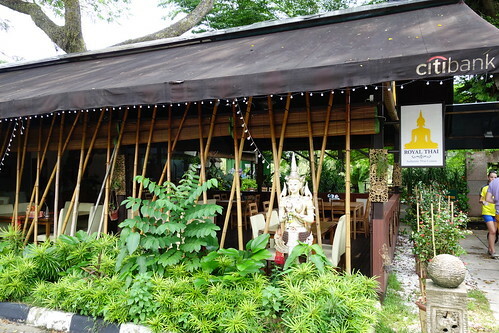 The furnishing at Royal Thai is basic but the verdant setting and balmy breeze more than made up for it. Away from the madding crowd and the noise of a bustling concrete jungle, a relaxing meal at Royal Thai felt like a short escape to a rustic Thai resort.